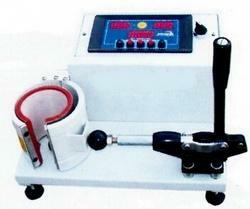 All Types of Quality Transfer Press Machines. 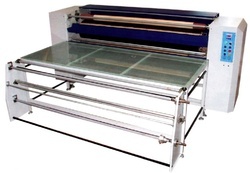 Fully automatic most versatile heat transfer press for extra large apparels and fabrics. Ideal machine for transfer printing, foil transfer, sublimation printing, fusing of collars cuffs, front placket and place mats. Electronic heater switching for noise free and zero maintenance. 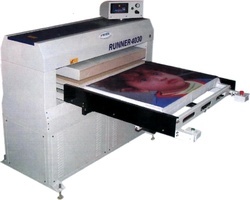 Very large platen there by no limitations of fabric size. Platen Size - 30" x 40"
M/C Dimensions - L 120" W 66" H 57"
Platen Size - 48" x 10"
M/C Dimensions - L 52" W 73" H 57"
Platen Size - 22" x 48"
M/C Dimensions - L 62" W 76" H 57"
Platen Size - 22" x 60"
M/C Dimensions - L 62" W 89" H 57"
Platen Size - 22" x 24"
M/C Dimensions - L 50" W 60" H 57"
Platen Size - 20" x 30"
M/C Dimensions - L 62" W 54" H 57"
Ideal to print on eco mugs. Micro processor based time and temperature controls. Heavy duty clamp for long service life. 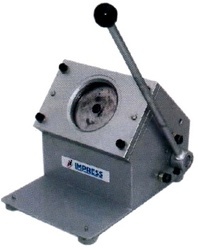 Wide heat barrel opening easy to lift and place. Superior quality machine runs for years without trouble. M/C Dimensions - L 25" W 17" H 16"
Ideal to print on caps. 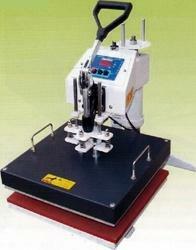 Inter changeable base platen for small and big sizes. Digital timer and temperature controls. Cap holder, holds the cap for easy use. Easy to lift and press handle. M/C Dimensions - L 27" W 13" H 27"
Ideal to print on ceramic plate. Clamp system for easy pressuring. M/C Dimensions - L 15" W 9" H 20"
Ideal to print on mugs. Ideal to print on t-shirts, key chains, ceramic tiles, wood and all kinds of flat materials. Digital temperature and timer controls. Very ecnomical, light and portable machine. M/C Dimensions - L 28" W 19" H 25"
Ideal to make button badge round paper cutting. 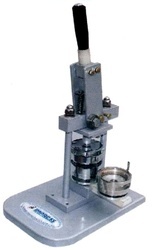 Manual clamp pressure for swift and fast action. Easy to press and cut handle. Perfect cutting through appropriate die. M/C Dimensions - L 9" W 6" H 12"
Ideal to make button badge crimping. Perfect crimping through appropriate moulds. Sturdy plastic design for long service life. M/C Dimensions - L 12" W 12" H 20"
Ideal to print on t-shirts, key chains, ceramic tiles, wood, mugs, ceramic plates, caps and all kinds of materials. .
Connector system to change the machine to adopt to all kinds of pressing operation. Three digit digital temperature and timer controls. Very high pressure achieved with the clamping system. 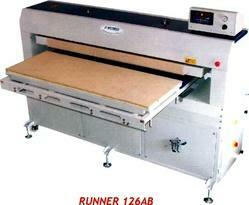 M/C Dimensions - L 23" W 17" H 16"
Rotary drum type continuous sublimation press machine. Ideal machine to print on roll fabrics and cut pieces. Easy operation through continous system. Rewind roller adopted to roll the finished printed paper. Easy to use digital micro controller to control all the parameters like drum rotation, temperature etc. Speed can be adjusted as per the printing cycle. Very precise heating through out the length of the cylinder. Very large width there by no limitations of fabric size. Low noise while the machine is in running condition. M/C Dimensions - L 34" W 94" H 48"
M/C Dimensions - L 34" W 76" H 48"
M/C Dimensions - L 34" W 58" H 48"